Haven’t decided on a hotel yet? 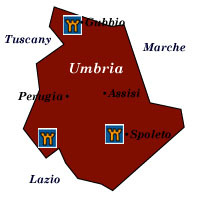 You can look at other available hotels in the Umbria region with Booking.com. If you are interested in staying in an Umbrian villa, Booking.com offers a number of stunning properties. Pastoral and traditional, Umbria offers a superb landscape of snowcapped mountains and vast stretches of olive trees and vineyards. In springtime, wildflowers in every imaginable shade burst into bloom throughout the region, only to be surpassed by brilliant sunflowers when summer rolls in. Umbria’s greatest charm lies with its network of wonderfully preserved medieval towns, highlighted by hilltop fortresses, grand Romanesque churches, and monasteries filled with art treasures galore. Although on the fast track to tourism and development, you can still find quiet corners—unchanged for centuries—in which to pass a day, or week, with the sunshine on your face and a glass or wine in hand. Palazzo dei Priori Considered the finest public building in Umbria, the façade of the 13th-century palazzo gives testament to Perugia’s former power. The 4th floor houses the Galleria Nazionale dell’Umbria, noteworthy for its 30 rooms of art dating back to the 13th century. Collegio del Cambio The 15th-century money exchange boasts outstanding frescoes by Perugino. Assisi Come to this rose-color hill town to pay homage to Italy’s patron saint, St. Francis. One of the most important destinations for Christians, millions of pilgrims come every year to pay homage at the Basilica di San Francesco, an exquisite architectural masterpiece adorned with frescoes by masters Giotto and Lorenzetti and a UNESCO World Heritage Site. Orvieto Perched precariously on a tufa plateau along the side of a cliff, a captivating maze of alleys and piazzas lead to the spectacular Duomo (cathedral), a Romanesque-Gothic architectural wonder. Its façade alone is said to be the most elaborately decorated monument in Italy, taking some 300 years to complete. For fun, take a tour through the tunnels and chambers that lie beneath Orvieto and learn about the town’s millennia-old past. Spoleto Roman and medieval attractions, a castle towering above the town, and a lovely setting, make Spoleto a year-round destination. Todi One of the most beautifully situated and romantic hill towns in Umbria, Todi’s Etruscan, Roman, and medieval past still permeates the air. Charming churches and palazzos, and over-the-top picturesque streets and piazzas make this village a worthy day trip. Gubbio In the northern part of Umbria, just slightly off the beaten path along the forested slopes of the Apennines, towers and ramparts define this well-preserved medieval town sometimes called the “City of Silence.” Visitors come not only to explore its fine churches, palazzos, and piazzas, but also to shop for its famed ceramics. Parco Nazionale dei Monti Sibillini Ancient legends relate that an enchantress awaits in her cave for the unwary and the devil has turned a lake red with his blood in this magical mountainous park. Medieval towns remain tucked away in the shadows of the mountains. Castles and lookout towers that once offered protection against Saracen raids dot the hillsides. This is gorgeous hiking country with abundant wildlife and precious spring and summer wildflowers. Truffles One of the world’s most delectable culinary delights is found throughout Umbria but especially in Norcia—in the Parco Nazionale dei Monti Sibillini—and Spoleto. If you’re here at the end of February/first weekend of March, join the music and traditional festivities of the Truffle Festival.